"Live Your Life" - perfect words to start the new year with, reflecting American Eagle Outfitters' spirit and values. It's all about keeping it real and being true to oneself, and that goes for creating your own personal style! 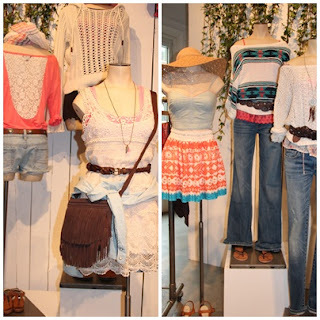 It's only January, but the spring collection is already out at American Eagle / Aerie stores, and it may as well be spring with the 50 degree weather we've been having in NYC. Here's a glimpse at what you'll find as you shop for spring. My top picks for layering underneath are the tied corset, sweetheart crop corset, eyelet corset, and lace trim boyfriend tank. For layering on top, try adding a fleece crew, crew sweater, wrap or ruffle crop cardi. As for dresses, my favorites are the corset dresses in either eyelet or floral style. I'm always on the lookout for AE jeggings, which now come in different colors - black, pink, white, red and cobalt! One thing I do have to work on is adding some denim shorts to my wardrobe! 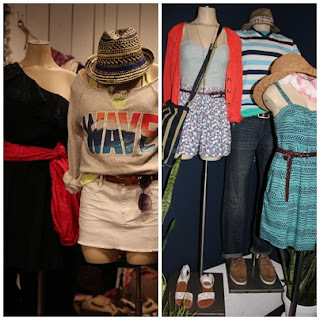 AE has a large assortment, including denim midi and bermuda shorts. I fall in love with AE's accessories each season - this time the multi floral scarf, gold bow necklace and gold bow ring, pattern fedora, navy tide stripe weekender bag and the cobalt blue deux lux mini messenger bag are at the top of my list! Aerie always has a feminine and comfortable pieces I love to lounge in, this time including the embroidered ruffle cami, corset cami, floral bustier cami, stripe knit maxi dress, relaxed lounge pant and chambray pocket shortie. I also highly recommend any of Aerie's push up bras, for a perfect fit!